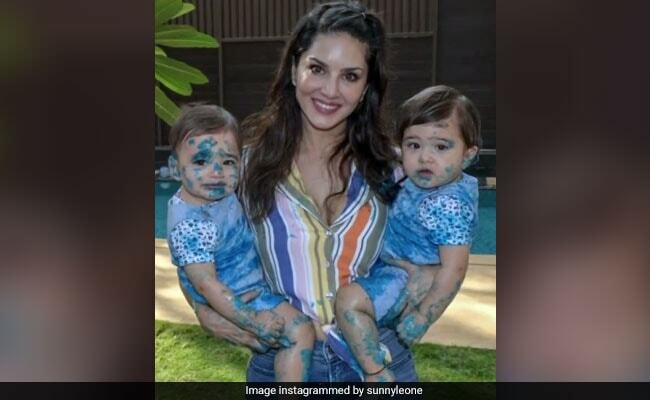 Sunny Leone's twins Noah and Asher are celebrating their first birthday today and the actress shared an adorable video montage to wish her sons on their special day. The video features Sunny with her husband Daniel Weber, daughter Nisha and the birthday boys. The video features glimpses from Noah and Asher's close-knit birthday celebration and cute can't even begin to describe Sunny's birthday post on Instagram. "Words can't explain the feelings we have for our family but I'll try. The last one year with Noah and Asher has been one of the most amazing years of my life. Nisha is the best big sister Noah and Asher could ever have. You are the light of my life and the reason I want to wake up every morning. Your smiles, hugs, kisses, and even your cute crying and whining brings me joy! Happy Birthday to my two little bundles of joy!! My mantra to myself every day to enjoy every sec I have with my family," the 37-year-old actress wrote. Sunny concluded her post with a quote by Thigh Nanh Hunh, which read: "I am here, I am now, In the here, In the now." Words can't explain the feelings we @dirrty99 have for our family but I'll try. The last one year with Noah and Asher has been one of the most amazing years of my life. Nisha is the best big sister Noah and Asher could ever have. You are the light of my life and the reason I want to wake up every morning. Your smiles, hugs, kisses, and even your cute crying and whining brings me joy! Happy Birthday to my two little bundles of joy!! My mantra to myself everyday to enjoy every sec I have with my family. "I am here, I am now, In the here, In the now." Quote by "thigh nanh hunh"
Noah and Asher were born via surrogacy. Sunny and Daniel had announced the birth of their twins last year on social media with adorable posts. "God's plan! June 21st, 2017 was the day Daniel and I found out that we might possibly be having three children within a short amount of time. We planned and tried to have a family and after so many years are family is now complete with Asher Singh Weber, Noah Singh Weber and Nisha Kaur Weber," read an excerpt from Sunny Leone's post. Sunny Leone and Daniel Weber are also parents to Nisha, whom they adopted in July from an orphanage in Latur (Maharashtra) when she was 21-months-old. In an interview to news agency IANS last year, Sunny Leone described how motherhood has changed her. "I have changed and evolved but I believe (it has happened) for the better. I look at all three of them and am I am completely, utterly in love with them. I believe I am the best mother I can be if I am working and spending time with them. I love my job and I hope my children grow up to be just as hard working as my husband and I," she said. On the work front, Sunny is currently filming Rangeela (her Malayalam film debut) and Tamil film Veeramadevi.